A raised head; the animal looks at observers. Mammals may point their ears in the direction of observers or stand up to face them. Any interruptions of feeding or migratory activities. Displays of nervous behavior: skittishness, the animal jumps at sounds or movements. Looking directly at an animal may trigger the fright/flight response it naturally has for predators. Birds repeatedly move away, preen, wipe their bills or peck at dirt or feet. Mammals might attempt to shield a calf or pup from a human intruder. Animals make alarm calls; birds will repeatedly chirp and chip; mammals vocalize; marine mammals will fin, tail-lob, or breach. Displays of aggressive behavior: the animal moves away or lowers its head (mammals will bring ears back in preparation for a charge); erect hairs on neck and shoulder; charges directed at intruders. Always be patient and be ready to back off so that your disturbance is minimized. 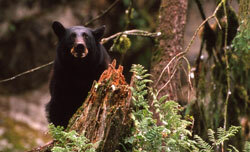 Scroll down the following list for more specific information about bears and other carnivores, large mammals, small mammals, marine mammals, coastal birds, wetland birds, forest birds and raptors, fish, intertidal life, and reptiles and amphibians. need lots of space and clear directions for easy retreat. Stay back, and never corner them. when startled, might run for an hour uphill, wasting precious energy reserves. Frequent disturbances are harmful. are especially dangerous when defending their kills or young. such as deer, elk and moose are unpredictable and can be dangerous. Always maintain a safe distance. need all their energy to survive through the winter. Disturbances can cause death. are vulnerable during the fall rut because males are under severe stress. Stay clear of their rutting grounds. are especially dangerous and highly sensitive to disturbance while looking after their young. need their energy stores in the spring for food gathering and territorial activity. Disturbance can lead to breeding failure. become more aggressive or dangerous if fed by people. Feeding also lowers their abilities to survive. Feeding animals in protected areas is illegal. such as roosting bats use critical fat reserves to “wake up” and flee from a disturbance. Avoid any place with roosting bats. are stressed if forced to swim in evasive patterns or dive into the water from a haulout or rookery. Remain at least 100 yards from marine mammals. Steer a steady, slow course and avoid cutting in front of them. may be especially vulnerable in certain locations, such as sea lion and seal haulouts and breeding colonies. Stay clear of these sensitive areas. nesting seabirds may abandon their nests from a single disturbance. Seabird island ecological reserves are closed during breeding season. migrating shorebirds need food energy to recharge for long flights. Avoid disturbing their feeding and staging activities. migrating shorebirds are particularly sensitive to dogs. Don’t bring dogs to beaches with shorebirds. that breed and rear young in lakes and rivers are particularly sensitive to disturbance. Stay clear of wetland nesting areas. sometimes nest directly at the water’s edge. These nests are vulnerable to large wakes from power boats. Please be sensitive to the wake left behind by your boat. Watch for camouflaged nests on the ground. need to conserve energy during North American winters to survive. Viewing should minimize disturbance at this time. can be stressed or endangered by too many people calling birds in with recorded bird calls. can lose eggs or young to predators if disturbed from the nest. Avoid going near nests. Make yourself less noticeable through the use of bird blinds and drab clothing. if stressed during spawning may move to less suitable spawning sites, leading to reduced reproductive success. eggs and newly hatched fish are sensitive to silting or any physical disruption, so avoid damage to the streambed. Reduce stream bank erosion by staying back from the stream edge. Use polarizing glasses to see into the water and binoculars to view fish from a distance. will die if removed from tidepools or rocks they are attached to. If rocks are moved, they should be carefully replaced exactly as they are found. Please be respectful of marine life if you walk over intertidal rocks and shelves. View tidepool life using a bucket with a clear plastic window glued to the bottom. Such as toads, frogs, and salamanders live in decaying logs and under slabs of bark or stones. Use trails and avoid trampling their homes. are highly sensitive to handling. Avoid handling these animals.